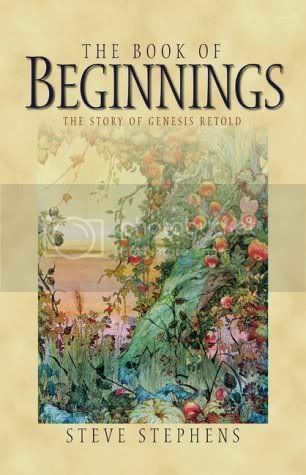 At breakfast time I have been reading aloud The Book of Beginnings: The Story of Genesis and Job to the Princess and we both have been savoring each chapter (and we are not quite done). It was just one of those special finds at a Goodwill store, not only because it looked brand new but also is absolutely delightful literature. I have enjoyed these embellished versions of Biblical stories very much because the style gives so much depth to the characters, even God. The feel of retold, almost fantasy-like stories of the ancients edging on a mysterious realm, but grounded in Biblical truths has been quite appealing for both my daughter and me. This book presents the stories as ones handed down orally from one generation of storyteller to another. The names are all changed so it is not evident at the beginning of each chapter which tale is being told but they are easily recognizable and each speaks of the personal struggles within the heart of each man and woman even in this age...at least, ones that I still have. "I have not learned trust," Schemer admitted. "Then walk with him as your father and as his father." "I will walk with him when he has brought me home safely." "Will you truly, when you do not trust him?" "Trust is not always easy," said Schemer, "when the world is full of danger and darkness and deceit." "Do you believe Promise-Keeper lives beyond the sky and holds the stars in his hands? Do you believe Promise-Keeper is infinite and eternal and all-powerful?" "Then the time has come to trust him." "We will see about that," said the angel as he stepped toward Schemer. Through the night the two wrestled. The angel would pin the man and ask, "Will you trust Promise-Keeper?" Each time Schemer escaped and responded, "I'm not ready." Finally the angel said, "When a lamb keeps wandering off the shepherd sometimes breaks the leg to make it dependent. Little lamb, if you truly wish to walk alone for now, that is your choice, but each step will be painful." And the angel reached down and twisted Schemer's hip from its joint. Pain shot through Schemer. As the first rays of morning touched the eastern sky, Schemer threw himself forward with his good leg and locked his arms around the angel's middle. "I cannot beat you, but I can hold on to you until you give me what I want." "I refuse to let go until you bless me." The angel tried to shake the man free, but Schemer held on with all his might. "Your determination is mighty," laughed the angel. "Today you have a new name. You shall no longer be Schemer, for your days of scheming are coming to an end. Now you shall be known as Wrestler. You have spent your life wrestling against Promise-Keeper. Every morning he called your name and every morning you turned your back. But your trust is growing and from this time forward you will wrestle to pull closer, not away. You will find your peace. Then you will walk freely each morning, not just because of your vow but because you've learned to let go." Schemer loosened his grip and thanked the angel. Then he let go and something deep inside felt good--very good. Have you wrestled with Promise-Keeper this morning? I had fun reading your excerpt to see how far I would get before recognizing the story. You found an incredible treasure! It sounds like something I'd like to add to my library.